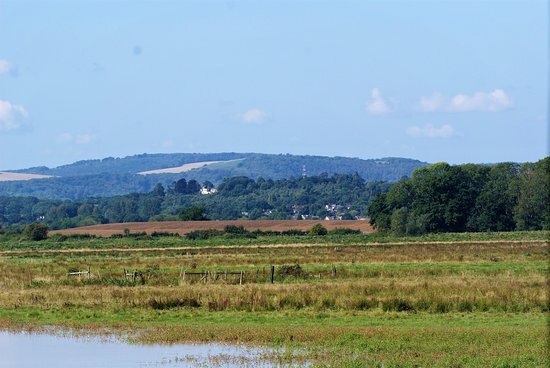 The next field meeting is to Pulborough Brooks on Sunday 19th May 2019. Hopefully Nightingales will be heard and possibly seen. Other summer visitors will be present and possibly some passage migrants. One of the interesting aspects of birding in Buckinghamshire is the arrival and departure of migrant species (such as the Cuckoo). Questions are often asked as to what is the earliest arrival date, or what is a typical arrival date for a specific species. The file below is a PDF file containing data on the various migrant birds species found in Buckinghamshire. 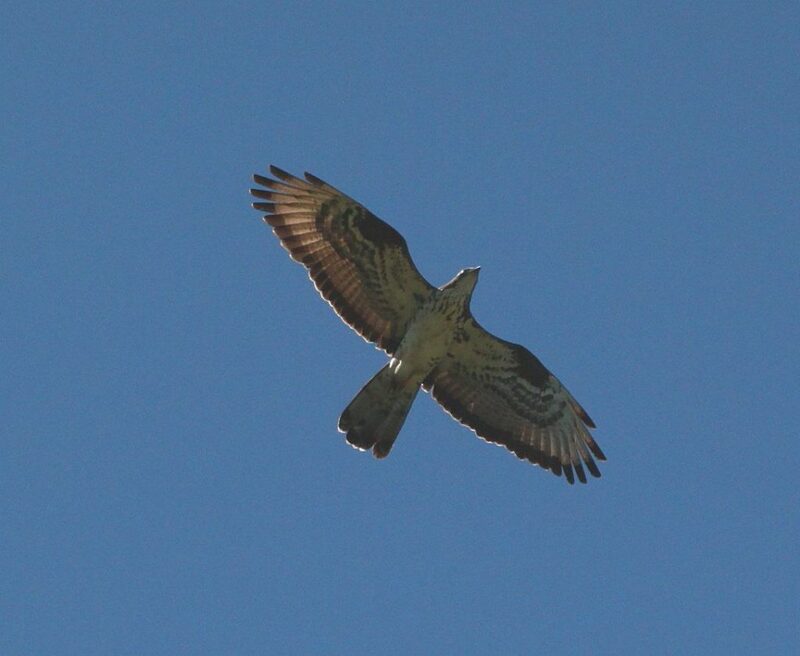 It includes Summer visitors, Winter visitors and passage migrants. Click on the download button to view the file. The data in the file has been extracted from Annual Reports for the county from 1971 until 2017. This work was carried out by Jim Rose and Graham Smith. The average dates given are that of the earliest records received and not the typical arrival date which is obviously somewhat later. The opposite of course applies to average late dates. Some species that are normally regarded as UK residents (e.g. Ringed Plover) can be treated as summer visitors to Bucks as there is a clear break in records during the winter months. Some species that are regarded as summer visitors to the UK, may in fact be treated as migrant species in Bucks (e.g. Wheatear), as it is possible to separate the spring passage from the return passage. Hence there are two sets of tables for these species (see Migrant Summer Visitors). You may find that there are some species missing from the tables that you might have expected to see. This may be due to the back that some species that are normally regarded as say a summer visitor do turn up during other months making it difficult to determine arrival and departure dates (e.g. Blackcap). Where the occasional exceptional record occurs (e.g. where a normal summer visitor is recorded over wintering) that record is ignored from the average date calculation and from the earliest/latest ever data. This is indicated against that species in the table. Additional years data will be added on the publication of the Buckinghamshire Annual Bird Report. Below is one example of how migrant arrival dates have changed over the years. It appears that Swallows now arrive up to ten days earlier than previously. 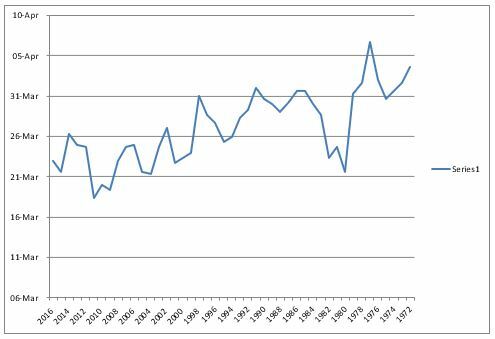 Note that the graph has been “smoothed” by plotting “three year averages”. Dave Ferguson has kindly updated the graphs showing the occurrence of some of the scarcer visitors to Buckinghamshire. For each of these species there is a graph showing the occurrence year by year and a separate graph showing the distribution of the species during the calendar year. Some of these are quite revealing. The species covered are the scarcer species that typically occur annually or near annually. The rarer species have all sightings listed on the Bucks Species List. The rarer birds with full details of sightings included in the Bucks Species List include birds such as the Divers, the Skuas, Dipper, Snow Buntings, etc. The scarcer birds with graphs include such species as the rarer Grebes, Bittern, the scarcer Swans, Smew, Red-breasted Merganser, Pied Flycatcher, Ring Ouzel, etc. The commoner species records are contained in the Annual Reports, the Monthly Bird Bulletins and in the Goingbirding database. The left hand graph for Smew clearly shows the window of occurrence between December and early March. The right hand graph shows just how scarce they have become in recent years. This may be due to less severe winters in continental Europe. The left hand graph clearly shows when you need to be out looking for Ring Ouzels in the county! The right hand graph is interesting as it seems to show an increase in the species occurrence. However this could be attributed to a better coverage by birders. All of the graphs can be accessed via the Bucks Species List where the words “See Chart” are given. Just click on these links to view the graphs. See image below. Note that the above is just an example image and it contains no links to the graphs. MEGA - Black-crowned Night Heron! The village of Chearsely lies between Aylesbury and Long Crendon and close to the River Thame. 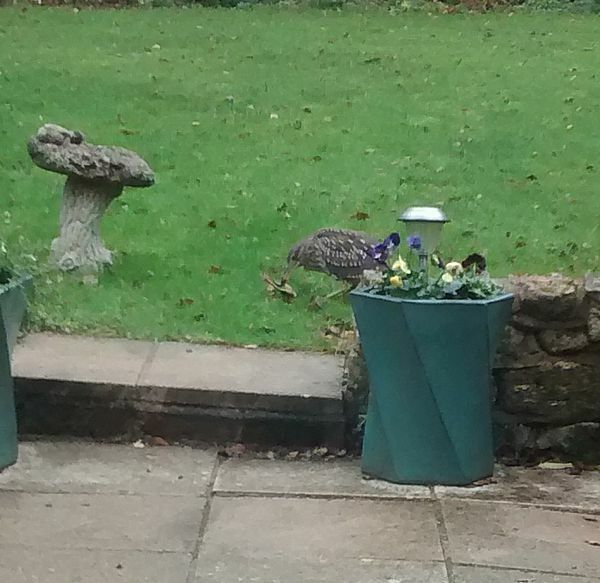 Resident John Weston noticed an unusual bird visiting his garden pond on 14th December 2018 and when it returned the following day he took the photos below. The bird also returned on the 16th December but was not seen thereafter. During it’s stay the bird was seen to eat several Frogs. 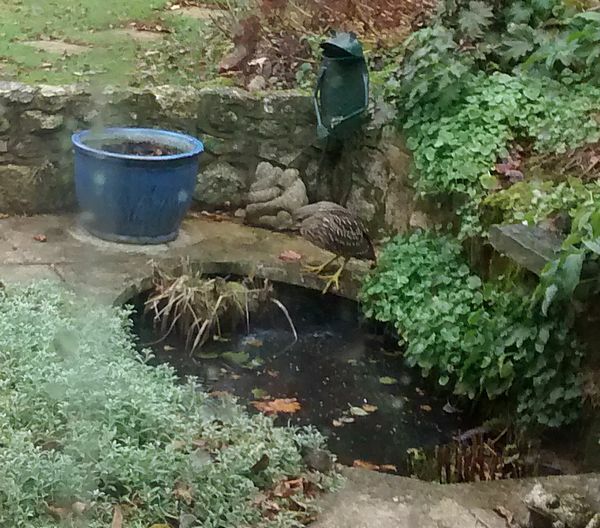 John thought that the bird was a Bittern but was not sure, so a couple of weeks later he sent the photographs to Andy Harding, our County Recorder. Andy soon confirmed that the bird was in fact a juvenile Black-crowned Night Heron, which is a county rarity! 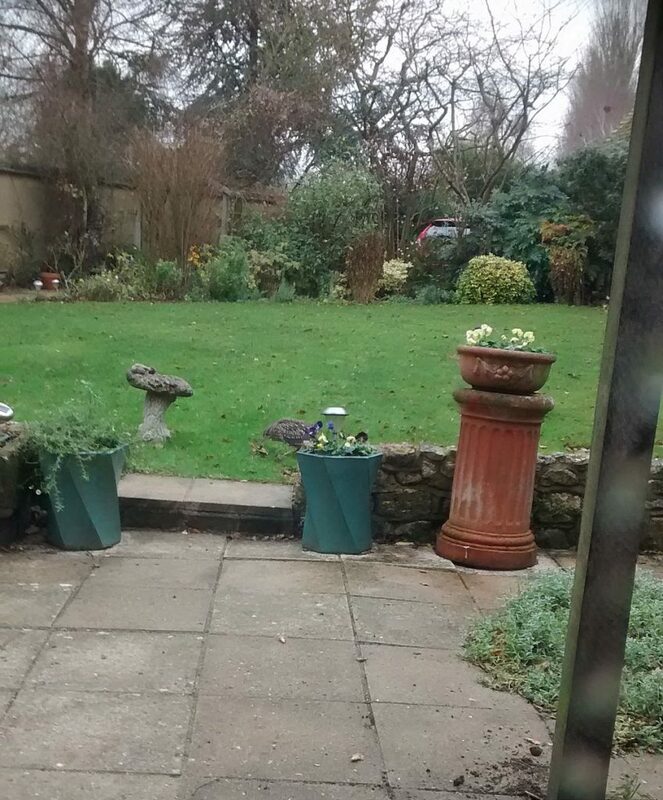 The following photos show the garden setting and an enlargement of the bird. Not exactly typical Night Heron Habitat! 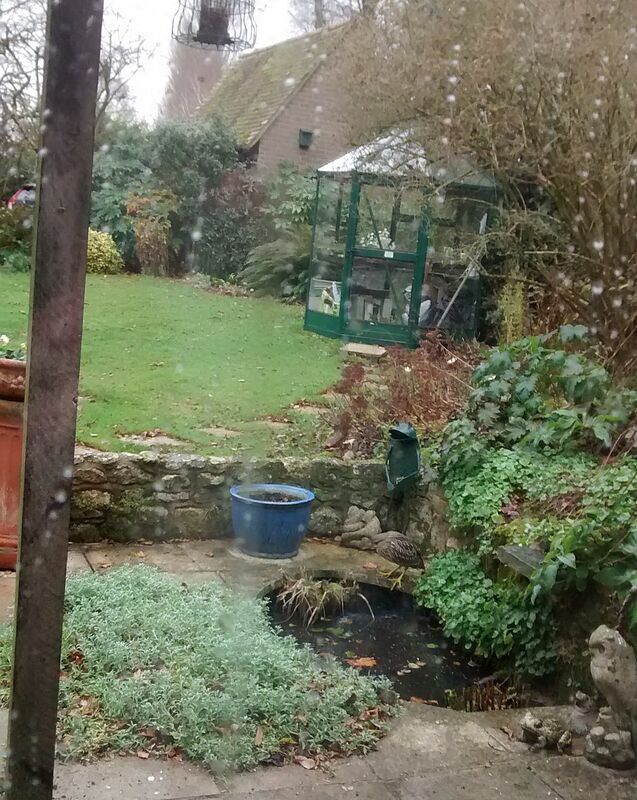 We should be thankful that the bird decided to feed during the day! This is just the seventh record of this species in the county since 1797!! 2017 Claydon Lakes – Probably a near adult seen on several dates between 22nd Aug and 15th Sep. Click here to view the post for this individual. 2018 Chearsley – A juvenile present in a garden from 14th to 16th Dec. Nationally there have been about a dozen records of Black-crowned Night Herons during 2018. December 30th, 2018 - news - MEGA – Black-crowned Night Heron! A few regular visits to Willen Lake (north) by Mike Wallen turned up trumps when he found a Spotted Crake early on the bank holiday Monday. Unfortunately it was rather distant at about 350 metres range! News was soon out and the bird was seen by many local birders as well as others from further afield. The bird remained until 27th September. 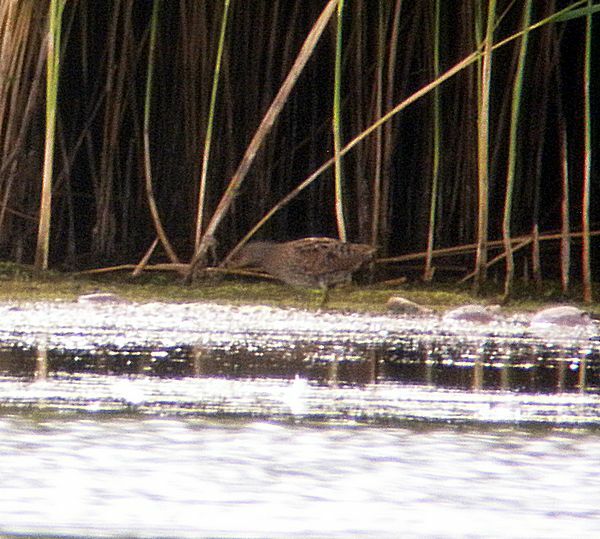 There were six Spotted Crake sightings in the UK on 27th August and a total of 13 so far for the month of August. The photo below is the only one received so far. Given the distance to the bird, people may not feel they have a worthwhile photo, but if you do have a better photo, hopefully from a closer range, then please send to Webeditor for possible inclusion in these pages. 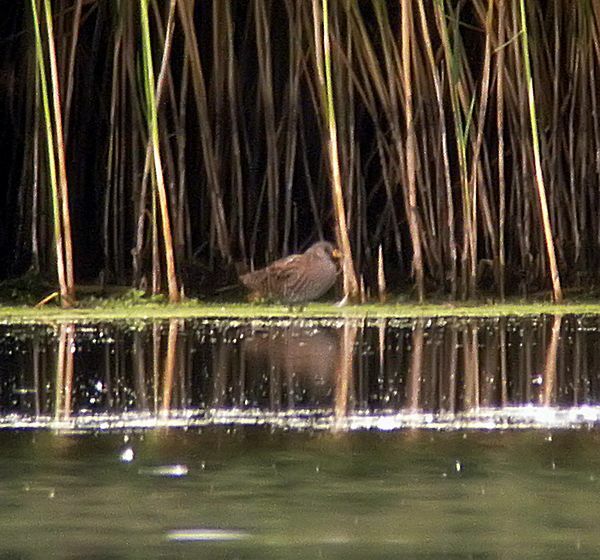 Spotted Crake – Above two photos copyright Phil Tizzard. This individual is only the fifth record record for the county, the others being listed below. A few historical records, now regarded as “unsafe” are not included. 1995 Willen – An adult 19th-23rd Aug, with a juvenile from 5th Sep.
2000 Dorney Common – A juv showed well for over a week in a stream on the Bucks/Berks border from 9th-19th Oct.
2003 Little Marlow GP – 1 29th-30th Mar. 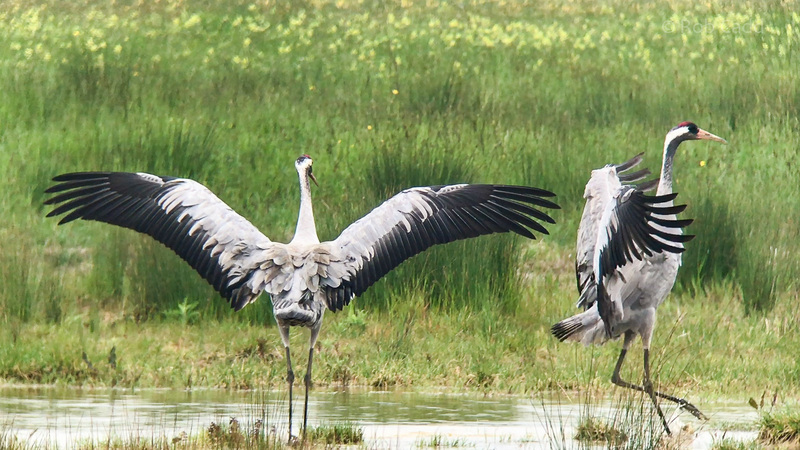 A few photos of these birds can be found at this link. 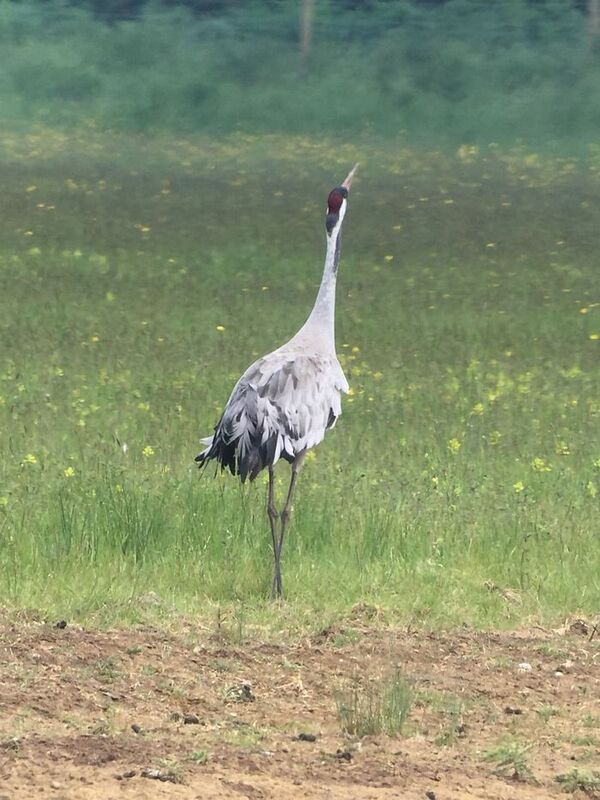 There are some nice photos of the Dorney Common bird. It is interesting that another Spotted Crake was found on the same day at Eton Wick, Berks but this is right on the Bucks border on Dorney Common and only about 150 metres from the sighting in 2000! 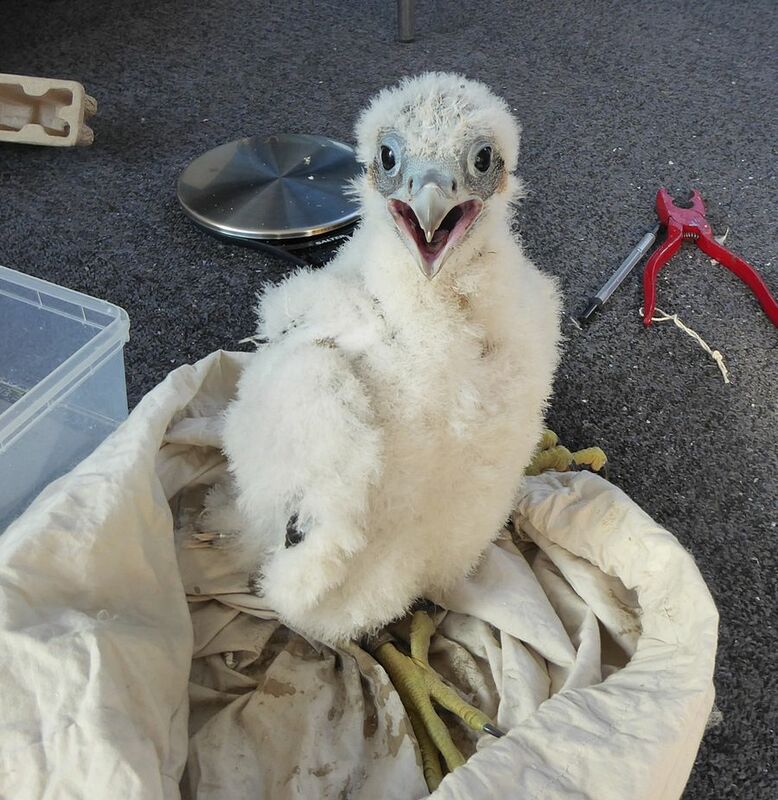 We have Peregrines breeding on the council offices building in Aylesbury once again and also at the MK Stadium in Milton Keynes. 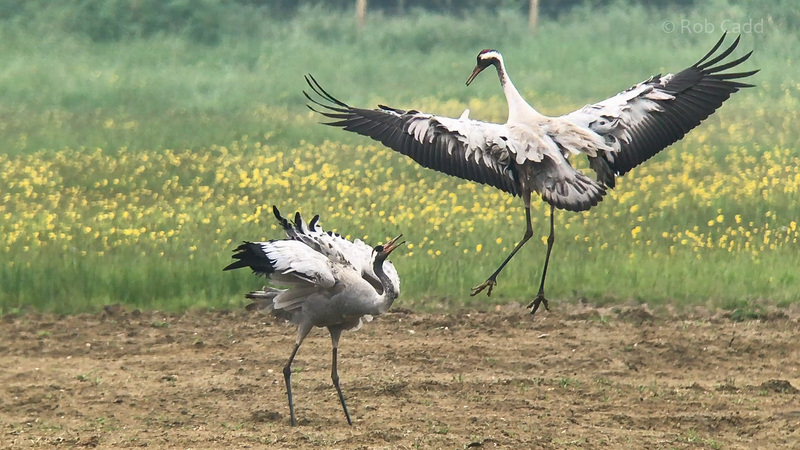 These have both become regular breeding locations for this amazing species. Unfortunately the links to the cameras at Aylesbury are not working this year, despite repeated attempts to fix. So we are very much in the dark as to the progress. Normally by the end of April hatching of the eggs takes place with fledging in early June. This year we will have to observe from a distance to see how things are going. As of 22nd May there was just one chick in the nestbox which was duly ringed. Unfortunately the Milton Keynes pair failed this year. 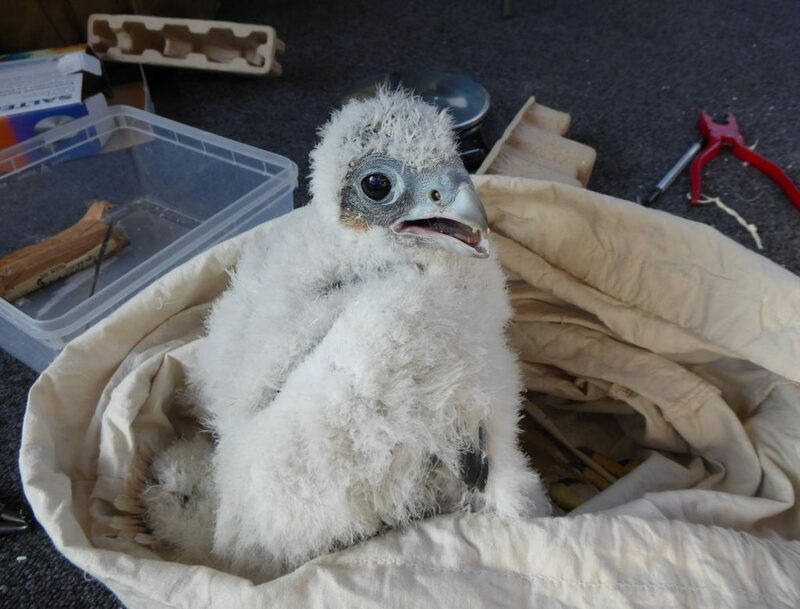 The Aylesbury youngster was taken to St Tiggywinckles for the second time as it is was found grounded and unable to fly. It stayed there for a week. Checks did not find anything wrong and it was released back on the office block on 30th June. All now seems OK and the parent birds are in attendance. Thanks to St Tiggywinkles for their fantastic support. 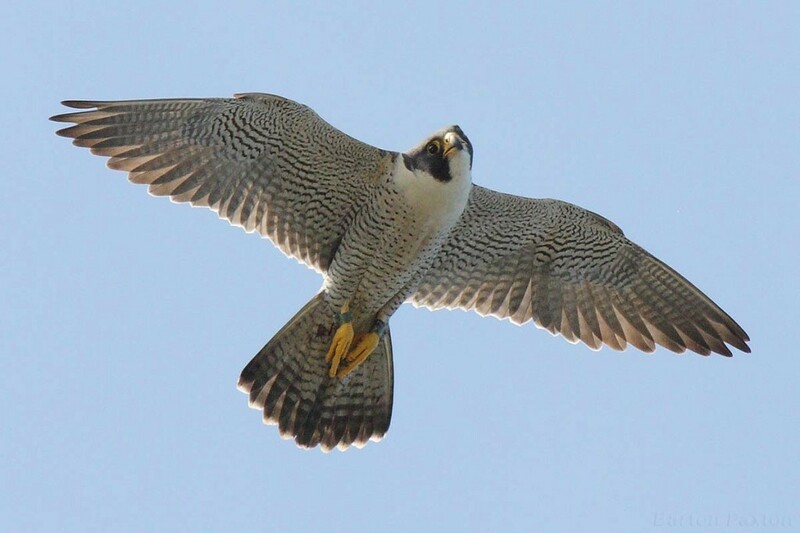 There are numerous Peregrine sightings on the Bucks Sightings website. If you wish to view them click on Search, enter “Peregrine” in the Species Name field, also change the date field to say search from the start of the year and you will see all Peregrine records for that period (unless suppressed to protect potential breeding birds). 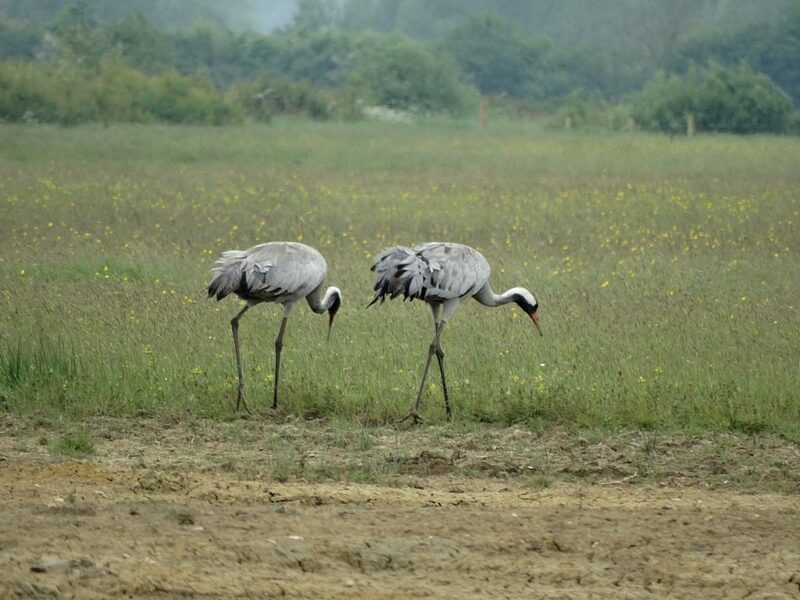 The Common Crane is a rare vagrant to Buckinghamshire and despite reintroduction schemes in the UK in recent years, there were no sightings of this species in 2016 and 2017. 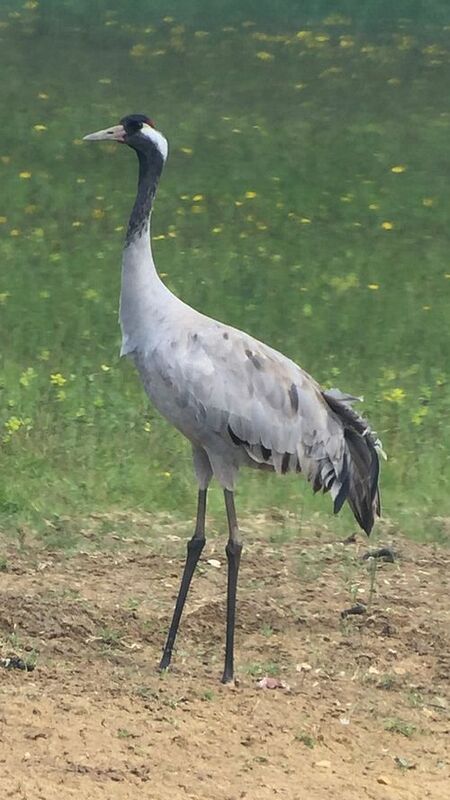 So when Warren Claydon found two at Gallows Bridge Farm BBOWT Reserve on 16th May, it was somewhat of a surprise! It was assumed that they would soon move on. However that was not the case and the birds were seen daily until 27th May attracting quite a lot of interest with local birders. 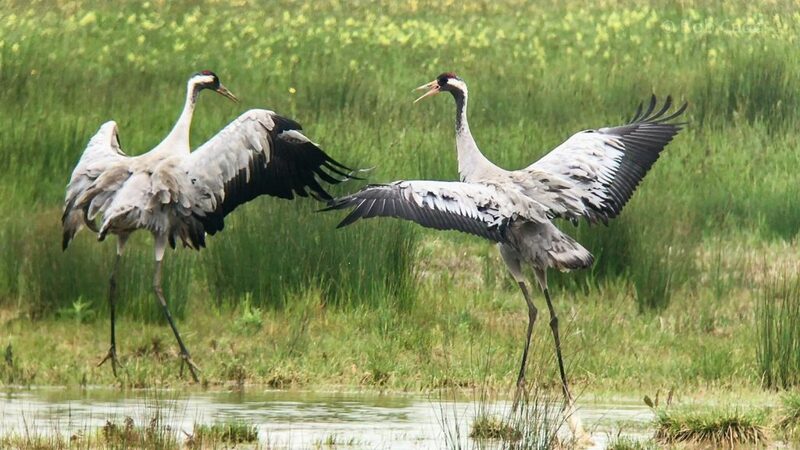 Fortunately the fact that the birds were on a nature reserve with excellent hides, birders could visit the hides with little or no disturbance to the birds. The two birds spent much of the time over the first few days at the far end of the reserve, so with warm sunny days, the views were not great due to the distance and the heat haze. From time to time the birds left the reserve and went onto nearby farmland presumably to feed. 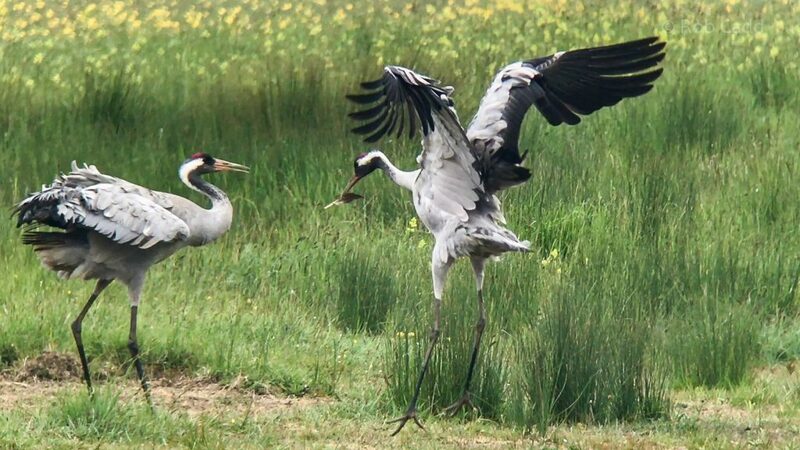 As the days went on the pair moved much closer to the hides and were seen to perform their display dance on more than one occasion. 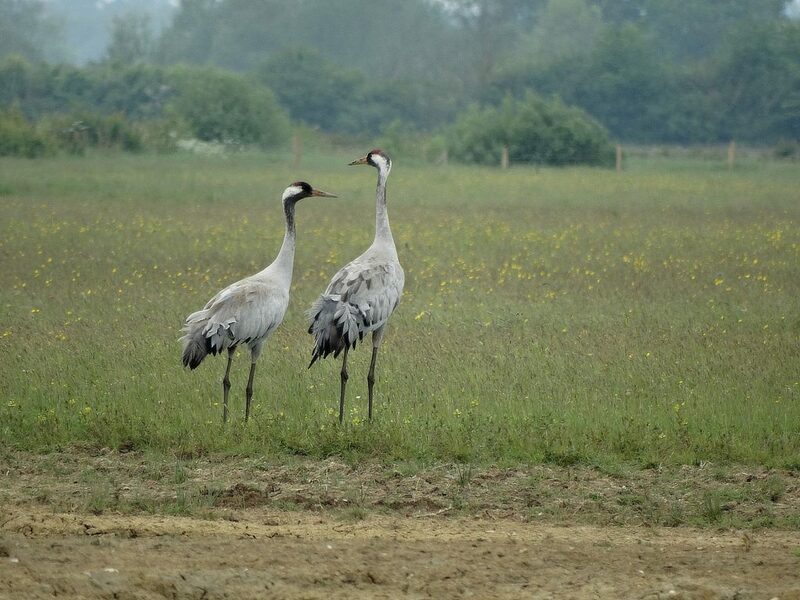 It was hoped they might stay and breed, albeit being quite late in the breeding season, but they departed probably overnight or early morning on 28th May. The following photos courtesy and copyright from the following people. John Edwards (top 2), Graham Smith (middle 2), Rob Cadd (lower 4). Click on the images to view full size. The pair were constantly close together. Parts of the dancing behavior shown in these four photos. On Sunday 22nd April about 12 club members met at the Gallows Bridge Farm BBOWT nature reserve. The plan was to meet at Gallows Bridge, see what birds were present and then move onto Quainton Hills and/or Calvert reserve. We got off to a good start in that the three Whimbrel that had arrived the previous day, were still present. We saw them on the ground and in flight with several Curlew. 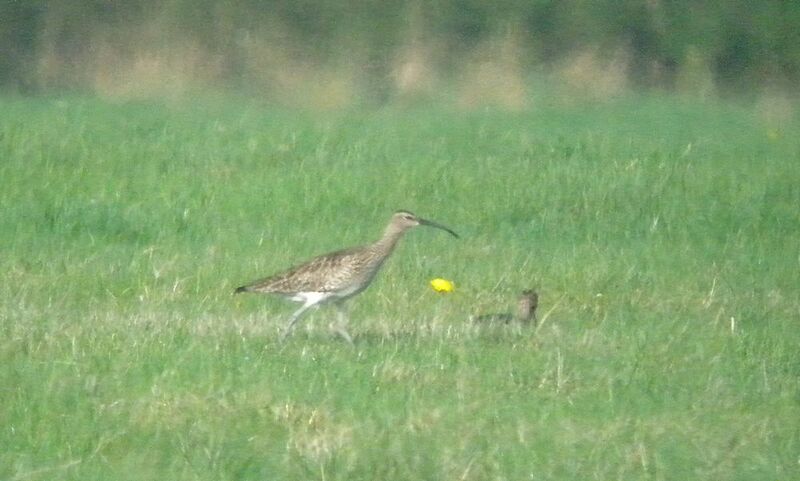 Whimbrel on the main meadow. 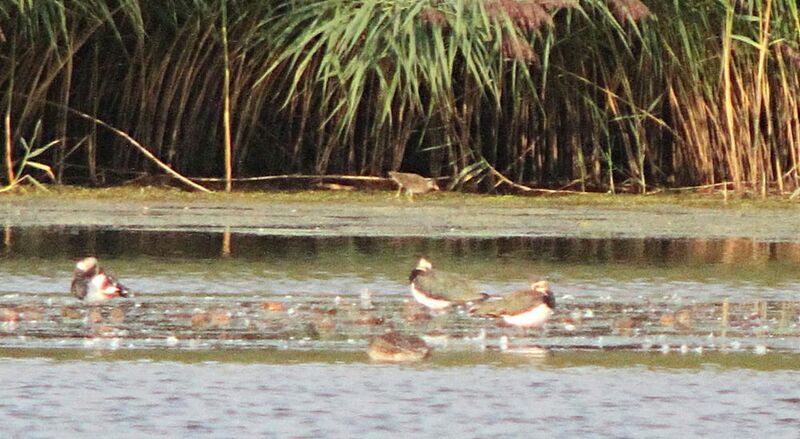 A rather distant photo! We were fortunate in that Laurie Bryant joined our group and he was able to take us to areas that are normally closed to the public. While walking around the reserve we saw four Curlew, a Raven, an Oystercatcher, a small flock of Linnet, Chiffchaffs, Blackcap, Meadow Pipit, Skylark, etc. The lack of other Warblers was noted. Despite the walk around the reserve was very interesting and gave a better idea of the value of this key BBOWT reserve. Some of the group then moved onto Quainton Hills where Tim Watts had seen two Ring Ouzels and five Wheatears earlier that morning. We were again fortunate to guided by Laurie Bryant who knew exactly where we needed to look. We parked near the church and walked across the hills to view the northern slopes. On the way Dave Cleal spotted a group of Ravens but other than that birds were a bit thin. Arriving at the northern slope we came across a stunning male Wheatear presumably a “Greenlander”. 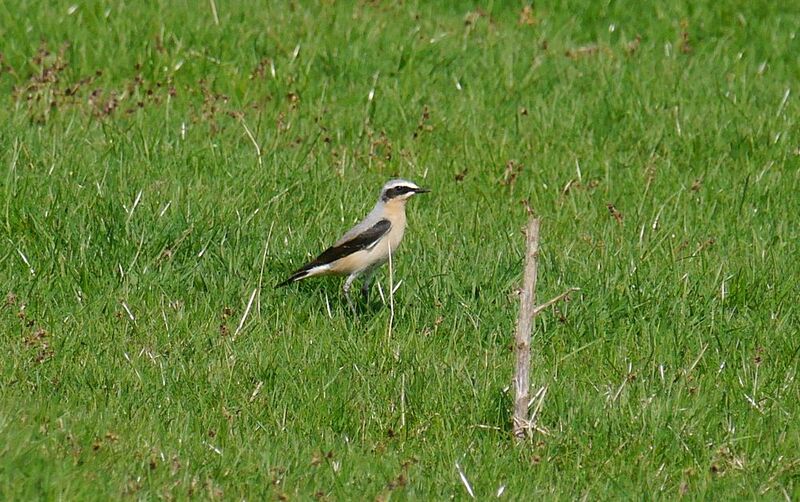 Wheatear on the Northern slopes. Another Wheatear was nearby. We sat and watched the area where a Ring Ouzel had been present for several days. After about 20 minutes a female Ring Ouzel flew out and gave us a decent view. It did not stay long and flew to another location and disappeared into vegetation. After that satisfactory conclusion we headed for the local pub! Thanks to Dave Cleal for leading the group and Laurie Bryant for guiding.